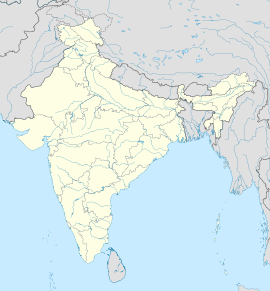 Kalibangān is a town located at 29°28′N 74°08′E﻿ / ﻿29.47°N 74.13°E﻿ / 29.47; 74.13 on the left or southern banks of the Ghaggar (Ghaggar-Hakra River) in Tehsil Pilibangān, between Suratgarh and Hanumangarh in Hanumangarh District, Rajasthan, India 205 km. from Bikaner. It is also identified as being established in the triangle of land at the confluence of Drishadvati and Sarasvati Rivers. The prehistoric and pre-Mauryan character of Indus Valley Civilization was first identified by Luigi Tessitori at this site. Kalibangan's excavation report was published in its entirety in 2003 by the Archaeological Survey of India, 34 years after the completion of excavations. The report concluded that Kalibangan was a major provincial capital of the Indus Valley Civilization. Kalibangan is distinguished by its unique fire altars and "world's earliest attested ploughed field". The identity of Kalibangan as a pre-historic site was discovered by Luigi Pio Tessitori, an Italian Indologist (1887–1919). He was doing some research in ancient Indian texts. He was surprised by the character of ruins in that area, and he sought help from Sir John Marshall of the Archaeological Survey of India. At that time ASI had some excavations done on Harappa, but they never had any idea about the character of the ruins. In fact, Tessitori is the first person to recognize that the ruins are 'Prehistoric' and pre-Mauryan. Luigi Pio Tessitori also pointed out the nature of the culture, but at that time it was not possible to guess that Indus Valley Civilisation lay in the ruins of Kalibangan, and he died five years before Harappan culture was duly recognized. After India's independence, both the major Harappan cities together with the Indus became a part of Pakistan and Indian archaeologists were compelled to intensify the search for Harappan sites in India. Amlānand Ghosh (Ex. Director General, Archaeological Survey of India, or ASI) was the first person to recognise this site as Harappan and marked it out for excavations. Under the leadership of B. B. Lal (then Director General, ASI), Balkrishna (B.K.) Thapar, M. D. Khare, K. M. Shrivastava and S. P. Jain carried out excavations for 9 years (1960-9) in 9 successive excavation sessions. Two ancient mounds were excavated, spread over half kilometre (area quarter square kilometre). On western side is the smaller mound (KLB1), 9 meters high and known as citadel. Eastern mound is higher (12 meters) and bigger, known as lower city (KLB2). The excavation unexpectedly brought to light a twofold sequence of cultures, of which the upper one (Kalibangan I) belongs to the Harappan, showing the characteristic grid layout of a metropolis and the lower one (Kalibangan II) was formerly called pre-Harappan but now it is called "Early Harappan or antecedent Harappan". Other nearby sites belonging to IVC include Balu, Haryana, Kunal, Haryana, Banawali etc. Traces of pre-Harappan culture have been found only at the lower levels of the western mound. According to archaeological evidence, the Indus Valley culture existed at the site from the proto-Harappan age (3500 BC - 2500 BC) to the Harappan age (2500 BC - 1750 BC). This earlier phase is labelled Kalibangan-I (KLB-I) or Period-I. Similarity of pottery relates Kalibangan-I with the Sothi culture because a lot of this pottery was later discovered at Sothi village in North Western India. Ruins of Kalibanga. Brick wall can be seen in the hole in the centre. In this phase, the settlement was fortified, using dried mud bricks, from the beginning of occupation. This fort had been built twice in different periods. Earlier, fort wall had a thickness of 1.9 meters, which was raised to 3.7-4.1 meters during reconstruction in this phase. Brick size was 20 × 20 × 10 cm in both construction-phases. The citadel mound (smaller mound) is a parallelogram about 130 meters on the east-west axis and 260 meters on the north-south. Town planning was like that of Mohenjodaro or Harappa. The direction of houses and brick sizes was markedly different from that used in the Harappan phase (KLB-II). Within the walled area, the houses were also built of mud bricks of the same size as used in the fort wall; the use of burnt bricks is attested by a drain within the houses, remains of ovens and cylindrical pits, lined with lime plaster. Some burnt wedge shaped bricks also have been found. B. B. Lal, former DG of ASI writes, "Kalibangan in Rajasthan has given the evidence of the earliest (c. 2800 BC) ploughed agricultural field ever revealed through an excavation.". It has been found south east of the pre-Harappan settlement, outside the fort. "Kalibangan excavations in present western Rajasthan shows a ploughed field, the first site of this nature in the world. It shows a grid pattern of furrows, placed about 30 cm apart running east-west and other spaced about 190 cm apart running north-south, a pattern remarkably similar to the one practiced even now.". Even today, similar ploughing is used for two simultaneous crops in this region, esp. of mustard and gram. For preservation, this excavated ploughed field area was refilled after excavation and the area was marked by concrete pillar posts. The distinguishing mark of this early phase is pottery, characterized by six fabrics labelled A, B, C, D, E and F, which were later identified also at Sothi in North Western India. Fabrics A, B, and D can be clubbed together. They are red painted. Fabric-A is carelessly potted in spite of use of potter's wheel. It contains designs in light-black, often decorated with white lines. Lines, semicircles, grids, insects, flowers, leaves, trees and squares were favourite motifs. Fabric-B shows marked improvement in finishing, but the lower half was deliberately roughened. Flowers, animals were painted in black on red background. Fabric-D contained designs of slanted lines or semicircles in some, while most pots were plain. But Fabric-C pottery was thicker and stronger. Fabric-C was distinguished by violet tinge and fine polish, with designs in black; it is the best proto-Harappan pottery in finishing. Fabric-E was light colored and Fabric-F was grey. Among the other finds of this Period are: small blades of chalcedony and agate, sometimes serrated or backed; beads of steatite, shell, carnelian, terracotta and copper; bangles of copper, shell and terracotta; terracotta objects like a toy-cart, wheel and a broken bull; quem with mullers, a bone point, and copper celts, including an unusual axe, etc. Toy carts suggest carts were used for transportation in early phase of Kalibangan. B. B. Lal, former DG of ASI writes,"Kalibangan in Rajasthan ... has also shown that there occurred an earthquake around 2600 BC, which brought to an end the Early Indus settlement at the site.". This is perhaps the earliest archaeologically recorded earthquake. At least three pre-historic earthquakes affecting the Indus Valley Civilization at Dholavira in Khadir have been identified during 2900–1800 BC. KLB-I phase has left 1.6 meters of continuous deposits during five distinct structural strata, the last of which was destroyed perhaps by an earthquake and the site was abandoned around 2600 BCE, soon to be settled again by Harappans. At Kalibangan, fire altars have been discovered, similar to those found at Lothal which S.R. Rao thinks could have served no other purpose than a ritualistic one. These altars suggest fire worship or worship of Murukan, the god of fire. It is the only Indus Valley Civilization site where there is no evidence to suggest the worship of the "mother goddess". Within the fortified citadel complex, the southern half contained many (five or six) raised platforms of mud bricks, mutually separated by corridors. Stairs were attached to these platforms. Vandalism of these platforms by brick robbers makes it difficult to reconstruct the original shape of structures above them but unmistakable remnants of oval fire-pits of burnt bricks for have been found, with a Pali Peedam or sacrificial post (cylindrical or with rectangular cross-section, sometimes bricks were laid upon each other to construct such a post) in the middle of each pit and sacrificial terracotta cakes in all these fire-pits. Houses in the lower town also contain similar altars. Burnt charcoals have been found in these fire-pits. The structure of these fire-altars is reminiscent of altars, but the analogy may be coincidental, and these altars are perhaps intended for some specific (perhaps religious) purpose by the community as a whole. In some fire-altars remnants of animals have been found, which suggest a possibility of animal-sacrifice. The official website of ASI reports : "Besides the above two principle [sic] parts of the metropolis there was also a third one-a moderate structure situated upwards of 80 m e. of the lower town containing four to five fire altars. This lonely structure may perhaps have been used for ritual purposes." Thus, fire-altars have been found in three groups: public altars in the citadel, household altars in lower town, and public altars in a third separate group. A short distance from fire altars, a well and remnants of a bathing place were found, suggesting ceremonial bath was a part of rituals. The lower town was also a fortified parallelogram, although only traces are now left. The fort was made of mud bricks (40 × 20 × 10 cm) and three or four structural phases have been recognized. It had gates in north and west. "Well-regulated streets (were) oriented almost invariably along with the cardinal directions, thus forming a grid-iron pattern. (At Kalibangan) even the widths of these streets were in a set ratio, i.e. if the narrowest lane was one unit in width, the other streets were twice, thrice and so on. (...) Such a town-planning was unknown in contemporary West Asia.". The lower town was 239 meters east to west, but north-south extent cannot be determined. 8 main roads have been recognized, 5 north-south and 3 east-west. Few more east-west roads are expected to be buried within the unexcavated remains. Second east-west road ran in a curved outline to meet the first at the north-eastern end (towards the river), where a gateway was provided. This road was an anomaly in the grid-pattern of straight roads. There were many lanes connected to specific housing complexes. Roads and lanes had widths in accurately determined proportions, like in other Harappan cities, ranging from 7.2 meters for main roads to 1.8 meters for narrow lanes. Fender posts were installed at street corners to prevent accidents. In second structural level, roads were laid with mud tiles. Drains from houses emptied into pits (soakage jars) beneath the roads. Some central authority must be there to plan and regulate all this. Some early Kalibangan pottery has close resemblance to the pottery of the Hakra ware in Cholistan, to other Early Harappan pottery from the Indus Valley Civilization and to the pottery of the Integration Era. Functionally, pottery can be classified into household pots, religious and burial purposes. Structurally, we have classes like plain and decorated wares. Some pots had Harappan inscriptions (undeciphered) on them. The best terracota figure from Kalibangan is that a charging bull which is considered to signify the "realistic and powerful folk art of Harappan Age". The city is known for the numerous terracota bangles found here. A number of seals have been found dating to this phase. Most noteworthy is a cylindrical seal, depicting a female figure between two male figures, fighting or threatening with spears. There is also a mixed person bull observing. They are of rectangular shape. A cylindrical graduated measuring rod and a clay ball with human figures are other notable finds. Peas and chickpeas were also found. Burial in rectangular or oval pit, with corpse laid down straight (extended), head northwards amidst pottery. In one pit a copper mirror was found among these objects. Pits were mud filled after burying. One grave was enclosed with a mud brick wall plastered from inside. One child had six holes in the skull. Many paleopathological evidences have been gathered from these graves. Burial in pot (urn) in a circular pit, with no corpse. Four to 29 pots and utensils were placed around the main pot (urn). In some graves beads, shell, etc have been found. Rectangular or oval grave-pit, containing only pottery and other funerary objects. Like the first type, the length of this type of graves was also along north-south. The latter two methods were not associated with any skeletal remains and may be related to symbolic burial, not found at other Harappan towns. The third type of graves contained objects as in the second type, like beads, shells, etc., but no corpse. Some pits were not filled  ASI official website :. Robert Raikes  has argued that Kalibangan was abandoned because the river dried up. Prof. B. B. Lal (retd. Director General of Archaeological Survey of India) supports this view by asserting: "Radiocarbon dates indicate that the Mature Harappan settlement at Kalibangan had to be abandoned around 2000–1900 BCE. And, as the hydrological evidence indicates, this abandonment took place on account of the drying up of the Sarasvati (Ghaggar). This latter part is duly established by the work of Raikes, an Italian hydrologist, and of his Indian collaborators". Kalibangan name translates to "black bangles" ("Kālā", in Hindi, means black and "bangan" means bangles). A few miles downstream is the railway station and township named Pilibangā, which means Yellow Bangles. ASI set up a Archaeological Museum at Kālibangan in 1983 to store the excavated materials here during 1961-69. In one gallery, Pre-Harappan finds are displayed, while Harappan finds are displayed in the other two galleries. ^ Calkins, PB; Alam M. "India". Encyclopædia Britannica. Retrieved 31 December 2008. ^ Lal, BB (2002). "The Homeland of Indo-European Languages and Culture: Some Thoughts". Purātattva. Indian Archaeological Society. pp. 1–5. ^ Lal, BB (2003). Excavations at Kalibangan, the Early Harappans, 1960-1969. Archaeological Survey of India. pp. 17, 98. ^ cf. Finding Forgotten Cities. ^ Shri Krishna Ojha, Elements of Indian Archaeology, p.115. ^ Elements of Indian Archaeology, p.116. ^ Elements of Indian Archaeology, p.117-118. ^ official website of ASI : http://asi.nic.in/asi_exca_imp_rajasthan.asp. ^ Elements of Indian Archaeology, p.117. This book gave exactly the same information, in almost same wording, which was later used in ASI website, hence unpublished excavation reports were source of both these accounts. ^ Lal, B. B., The earliest datable earthquake in India. ^ Elements of Indian Archaeology, p.119-120. ^ a b "Excavation Sites in Rajasthan - Archaeological Survey of India". ^ Bryant, Edwin (2001). The quest for the origins of Vedic culture the Indo-Aryan migration debate. New York: Oxford University Press. p. 160. ISBN 9780195137774. Retrieved 17 November 2014. ^ Elements of Indian Archaeology, p. 120-121. ^ Elements of Indian Archaeology, p.121. ^ Elements of Indian Archaeology, p.117. ^ Elements of Indian Archaeology, p.123. Wikimedia Commons has media related to Kalibangan. Thapar, B.K. 1975. Kalibangan: a Harappan Metropolis Beyond the Indus Valley, Expedition XVII(2): 13-19.